September 1st, 2014 was the centenary of one of the best-documented extinctions in history – the demise of the Passenger Pigeon. From being the commonest bird on the planet 50 years earlier, the species became extinct with the death in Cincinatti Zoo of Martha, the last of her kind. A Message from Martha marks the centenary of that tragic event. Built around the framework of a visit to the pigeon's former haunts in eastern North America by author Mark Avery, it tells the tale of the pigeon, and of Martha, and explores the largely untold story of the ecological annihilation of this part of America in the years between the end of the US Civil War and 1900. This period saw an unprecedented loss of natural beauty and richness, as forests were felled and the prairies were ploughed, swiftly to be replaced by a dustbowl, while wildlife was slaughtered indiscriminately. 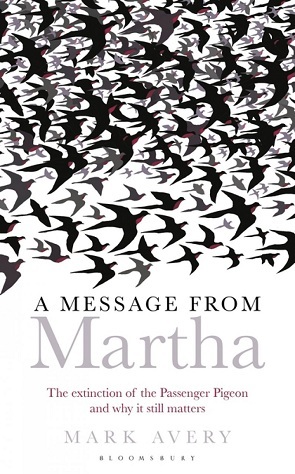 Written engagingly and with an element of travelogue as well as historical detective work, A Message from Martha is more than another depressing tale of human greed and ecological stupidity. It contains an underlying message – that we need to re-forge our relationship with the natural world on which we depend, and plan a more sustainable future. Otherwise the tipping point will be crossed and more species will go the way of the Passenger Pigeon. 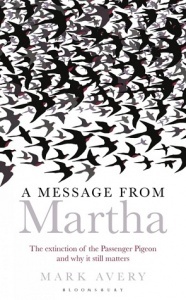 We should listen to the message from Martha.